​Fire Circles have ever been the central gathering point for groups, providing warmth, friendship and camaraderie among individuals. Sugar Valley Airport was the perfect location for creating what has become one of the first of dozens of fire circles located at small airports around the country. ​The Fire Circle is an actual fire ring in the center of a 40' square brick patio that can be used by recreational flyers, scouts, churches, civic organizations and other groups during on-field camping, family or other activities. It is strategically located on the grounds of the airport, overlooking the lake and the setting sun. 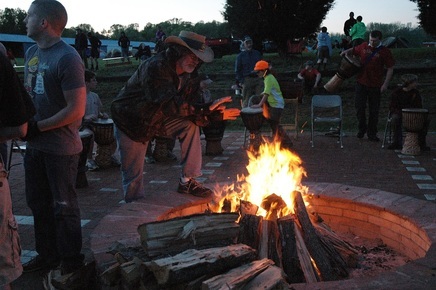 The Friendship Fire Circle, sponsored by the former Honda Flying Club (now Piedmont Aero Club) and Sugar Valley Airport, was dedicated on April 21, 2012. Purchase a Brick! A Brick? Yes, a Brick. Purchase a commemorative brick which will be inscribed with wording of your choice. The brick will be placed on the ground around the fire circle to serve as a perpetual reminder of the object of your contribution. Inscriptions are lasting inspirations that can include your name and home town, short quotes, be in honor or memory of loved ones, veterans, aviators or organizations, etc. Bricks come in two sizes: 4” x 8” and 8” x 8”. The smaller one can be created with a contribution of $100, while the larger is $200. These contributions are tax deductible. Also available are 8 x 8” bricks with your corporate or other logo, and bricks that showcase your signature. ~ Scholarships for training as an A&P or Avionics Technician. ~ Oshkosh/Sun 'N Fun scholarships. ~ Hosting AOPA, EAA, and other aviation events. ~ Purchase of flight training equipment. EAA Young Eagles programs, and similar activities. ~ Programs promoting aviation safety.